Tyler Perry’s inspirational journey from the hard streets of New Orleans to the heights of Hollywood's A-list is the stuff of American legend. Born into poverty and raised in a household scarred by abuse, Tyler fought from a young age to find the strength, faith and perseverance that would later form the foundations of his much-acclaimed plays, films, books and shows. It was a simple piece of advice from Oprah Winfrey that set Tyler's career in motion. Encouraged to keep a diary of his daily thoughts and experiences, he began writing a series of soul-searching letters to himself. The letters, full of pain and in time, forgiveness, became a healing catharsis. His writing inspired a musical, “I Know I've Been Changed,” and in 1992 Tyler gathered his life's savings and set off for Atlanta in hopes of staging it for sold out crowds. And so began an incredible run of thirteen plays in as many years, including “Woman Thou Art Loosed!,” a celebrated collaboration with the prominent Dallas pastor T.D. Jakes. In early 2005, Tyler's first feature film, “Diary of a Mad Black Woman,” debuted at #1 nationwide. His ensuing films “Madea's Family Reunion,” “ Daddy’s Little Girls,” “Why Did I Get Married?,” “ Meet The Browns,” “The Family That Preys,” “I Can Do Bad All by Myself” and “Why Did I Get Married Too?” have all met with massive critical and commercial success, delighting audiences across America and around the world. 2006 saw the publication of Tyler's first book, “Don't Make a Black Woman Take Off Her Earrings: Madea's Uninhibited Commentaries On Life And Love,” which shot to the top of the New York Times nonfiction bestseller list and remained there for eight weeks. It went on to claim Quill Book Awards for both "Humor" and "Book of the Year" (an unheard-of feat for a first-time author), and spread Tyler Perry's unique brand of inspirational entertainment to a devoted new audience. 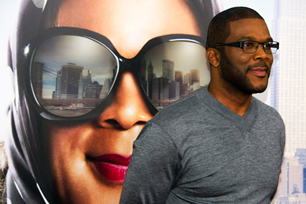 Not one to rest on success, Tyler Perry and his 300+ Atlanta-based employees are always hard at work. In the fall of 2008, he opened his 200,000 square foot Studio in Atlanta, situated on the former Delta Airlines campus of more than 30 acres. The Studio consists of 5 sound stages, a post production facility, a pond, a back lot, a 400-seat theater, a private screening room, and designated areas for entertaining and hosting events. But listen to Tyler Perry and you'll hear a man who hasn't forgotten about the people that have helped him reach the top of a mountain he could once only dream of climbing. He has donated generously to charities that focus on helping the homeless, such as Feeding America, Covenant House, Hosea Feed the Hungry, Project Adventure, and Perry Place - a 20-home community that Tyler built for survivors of Hurricane Katrina in New Orleans. In July 2009, Tyler sponsored a trip to Walt Disney World for 65 children after learning that a suburban swim club had turned them away because of the color of their skin. Tyler Perry has also built 2 churches and has donated generously to the NAACP. In January 2010, Perry pledged $1,000,000 via The Tyler Perry Foundation to help rebuild the lives of those affected by the recent earthquakes in Haiti. Tyler Perry practices what he preaches, and what he preaches has endeared him to millions of fans drawn by that unique blend of spiritual hope and down-home humor that continues to shape his inspiring life story and extraordinary body of work. Here, he talks about his latest film, “Madea’s Witness Protection,“ which he not only wrote, directed and produced, but also stars in, playing three roles, including the sassy, straight-talking title character. LAWT: Hi Tyler. I’m very honored to be speaking with you again, brother. Tyler Perry: Oh, good, Kam! How’re you doing? LAWT: Great! I really enjoyed this film. Where did you come up with the inspired idea of mixing Madea with a family in the Witness Protection Program? TP: I was having dinner with a friend, and we were talking about Bernie Madoff, and he said, “You know what would be a great punishment for Bernie Madoff? If he had to go live with Madea.” [Chuckles] I thought, man, that’s a great concept! I need to go write that script. And then when I asked myself who could play the Bernie Madoff character, of course, I thought of Eugene Levy. LAWT: How did you determine the casting? Looks like you went for a lot of veteran comedians this time out: Eugene Levy of the American Pie franchise, John Amos of Good Times, Marla Gibbs of The Jeffersons, Doris Roberts of Everybody Loves Raymond, and even Charlie Sheen if you don’t mind my mentioning him in this article since he makes such a surprising cameo. TP: That’s okay, since he’s only in the outtakes at the very end of the movie. But I was definitely looking for some heavyweights to help me carry the picture, and those were the right people to rely on. So, I’m pretty excited about it. LAWT: What message do you want people to take away from Madea’s Witness Protection Program? TP: What is clear to me is that it’s about everything in your life: work, and struggling, and paying attention to grinding, grinding, grinding. It takes their going into a simple situation, living with Madea, a woman who doesn’t even have wi-fi, to realize what family is, come back together, and get to know each other. LAWT: I have some questions for you from fans. Leon Marquis asks: Do you wear a girdle as Madea? TP: [LOL] You tell Leon, “Hell no!” It’s bad enough being stuffed into that costume. It’s just one piece that gets zipped up the back. LAWT: Editor/legist Patricia Turnier asks: Is there a new genre of movie that you would like to make in the future? TP: Absolutely! It’s not a new genre, but a new genre for me: sci-fi. I have a great sci-fi story that I’m currently working on. I’m going to be all over the place… all over the place. LAWT: Patricia also asks: What advice do you have for young people entering the movie industry who want to be multifaceted like you are? TP: You have to want it more than breathing. Developing a good work ethic is key. Apply yourself at whatever you do, whether you’re a janitor or taking your first summer job, because that work ethic will be reflected in everything you do in life. LAWT: Jessica Angelique says: Mr. Perry, I have recently published my autobiography, “Alas Peace Be Still,” which is dedicated to you. I was inspired to write it after experiencing a catharsis while listening to you share your life story with Oprah Winfrey on October 27th, 2010. I wanted to know if you would be so kind as to write a few words for the Foreword of the second edition. I also hope to actually meet you in person one day to be able to thank you for what you did for me. I don’t think I would be alive today had it not been for your help and the grace of God. TP: Wow! That’s pretty powerful. Yes, I’d love to, Jessica. Get a copy of the book to me, Kam. LAWT: Sticking with the Oprah theme, legal recruiter Nicole Ibanez wants to know why you always cry on Oprah. TP: [LOL] I’ve been on Oprah a dozen times, and cried once. Tell Nicole to lighten up. LAWT: The Kerry Washington question: If you were an animal, what animal would you be? TP: That depends on the time of day, because I go from a lion in the morning to a black bear in the evening. LAWT: The Laz Alonso question: How can your fans help you? TP: I had one request when I started doing the plays. My prayer was: God let me do well enough to be able to take care of my mother. I was able to do that ‘til the day she died because of my audience. So, they’ve already done enough. All I ask for now is their continued support. LAWT: The Pastor Alex Kendrick question: When do you feel the most content? TP: When I have absolutely nothing to do, and I find myself in the middle of all of it going, “Wow!” When nothing’s going on, that’s when I get to stop and really appreciate the journey. LAWT: What do you wish other people would note about you? TP: I’ve been pretty transparent with all that I’ve done. I think my work speaks a lot for who I am. So, I don’t think there’s a particular thing I’d like them to know. TP: Gosh, the motivations have changed so much over the years. Today, seeing people laugh definitely inspires me, and so does seeing people get life lessons about living better. LAWT: What defines who you are? TP: My faith in God. LAWT: What advice do you have for anyone who wants to follow in your footsteps? TP: Don’t. They should be finding their own paths. LAWT: Thanks again for the time, Tyler, and best of luck with the movie.